The very first footage from the final season of Game of Thrones aired during tonight’s Golden Globe awards. Almost a month after airing the first promo of "Game of Thrones" season 8, HBO released yet another very short footage of the most awaited, final season of the series Game of Thrones. The very first Game of Thrones footage from the final season debuted at the Golden Globe Awards on Sunday night. A short commercial break aired during the function which gave a brief outlook on the HBO's upcoming shows including Game of Thrones. Additionally, the other shows teased in the promo include the small glimpses of the second season of Big Little Lies, the final season of Veep, the long-awaited third season of True Detective, and the second season of Barry. Furthermore, the footage showed the first look at Damon Lindelof’s Watchmen. And while those are all exciting projects, it’s tough to steal the spotlight away from Game of Thrones. Initially, the clip features a dragon flying over the Game of Thrones' base. 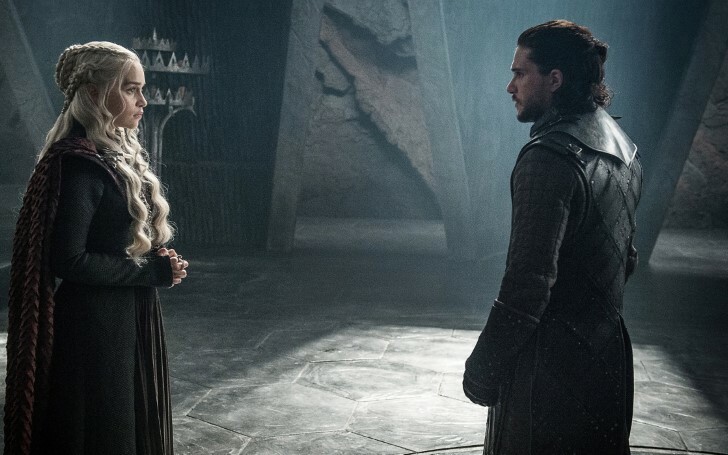 The footage begins with “Winterfell is yours, your grace” as Sansa Stark greets Daenerys Targaryen on her arrival in Winterfell alongside Jon Snow. HBO releases new Game of Thrones season 8 footage Sansa meeting Daenerys. Though brief, the six seconds-long footage is crucial as it alludes to the possible alliance of Sansa Stark and Daenerys Targaryen. Apart from this, the GOT fans are impatiently waiting for the reunion between Jon and Arya. Along with it, it's been assumed that Jon will also find out his new lover, is also his aunt. The final season of Game of Thrones is due to be released in April 2019.